A hybrid approach to fabricating soft materials at the millimeter scale could pave the way for a new generation of flexible micro-robots for medical and environmental tasks. Also new is a 3D printing technique that enables faster and better physical models of patient-specific medical data. CAMBRIDGE, Mass. — Roboticists are envisioning a future in which soft, animal-inspired robots can be safely deployed in difficult-to-access environments, such as inside the human body or in spaces that are too dangerous for humans to work, in which rigid robots cannot currently be used. Centimeter-sized soft robots have been created, but thus far, it has not been possible to fabricate multifunctional flexible robots that can move and operate at smaller size scales. A team of researchers at Harvard’s Wyss Institute for Biologically Inspired Engineering, Harvard John A. Paulson School of Engineering and Applied Sciences (SEAS), and Boston University now has overcome this challenge by developing an integrated fabrication process that enables the design of soft robots on the millimeter scale with micrometer-scale features. 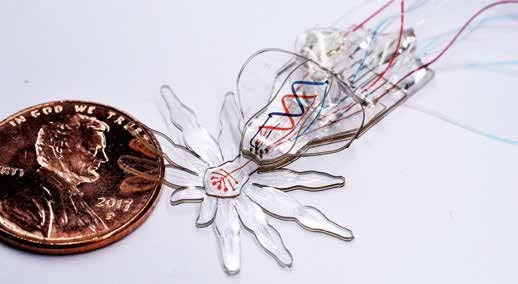 To demonstrate the capabilities of their new technology, the team created a robotic soft spider—inspired by the millimeter-sized colorful Australian peacock spider—from a single elastic material with body-shaping, motion, and color features. The study is published in Advanced Materials. Key to transforming this intermediate structure into the final design is a pre-conceived network of hollow microfluidic channels that is integrated into individual layers. A third technique, known as injection induced self-folding, pressurized one set of these integrated microfluidic channels with a curable resin from the outside. This induces individual layers and, with them, also their neighboring layers, to locally bend into their final configuration, which is fixed in space when the resin hardens. This way, for example, the soft spider’s swollen abdomen and downward-curved legs become permanent features. The remaining set of integrated microfluidic channels were used as additional actuators to colorize the eyes and simulate the abdominal color patterns of the peacock spider species by flowing colored fluids; and to induce walking-like movements in the leg structures. “This first MORPH system was fabricated in a single, monolithic process that can be performed in a few days and easily iterated in design optimization efforts,” said Ranzani. Additional authors on the study are Nicholas Bartlett, a graduate student on Wood’s team, and Michael Wehner, Ph.D., a former postdoctoral fellow with Wood, who now is assistant professor at University of California Santa Cruz. The study was funded by Harvard’s Wyss Institute, the Defense Advanced Research Project Agency (DARPA), and a National Defense Science and Engineering Graduate Fellowship. The Harvard John A. Paulson School of Engineering and Applied Sciences (http://seas.harvard.edu) serves as the connector and integrator of Harvard’s teaching and research efforts in engineering, applied sciences, and technology. Benjamin Boettner is a science writer for the Wyss Institute for Biologically Inspired Engineering at Harvard University. BOSTON — What if you could hold a physical model of your own brain in your hands, accurate down to its every unique fold? That’s just a normal part of life for Steven Keating, Ph.D., who had a baseball-sized tumor removed from his brain at age 26 while he was a graduate student in the MIT Media Lab’s Mediated Matter group. Curious to see what his brain actually looked like before the tumor was removed, and with the goal of better understanding his diagnosis and treatment options, Keating collected his medical data and began 3D printing his MRI and CT scans, but was frustrated that existing methods were prohibitively time-intensive, cumbersome, and failed to accurately reveal important features of interest. Keating reached out to some of his group’s collaborators, including members of the Wyss Institute at Harvard University, who were exploring a new method for 3D printing biological samples. “It never occurred to us to use this approach for human anatomy until Steve came to us and said, ‘Guys, here’s my data, what can we do?” said Ahmed Hosny, who was a research fellow with at the Wyss Institute at the time and is now a machine learning engineer at the Dana-Farber Cancer Institute. The result of that impromptu collaboration—which grew to involve James Weaver, Ph.D., senior research scientist at the Wyss Institute; Neri Oxman, Ph.D., director of the MIT Media Lab’s Mediated Matter group and associate professor of Media Arts and Sciences; and a team of researchers and physicians at several other academic and medical centers in the U.S. and Germany—is a new technique that allows images from MRI, CT, and other medical scans to be easily and quickly converted into physical models with unprecedented detail. The research is reported in 3D Printing and Additive Manufacturing. However, there is a problem: MRI and CT scans produce images with so much detail that the objects of interest need to be isolated from surrounding tissue and converted into surface meshes in order to be printed. 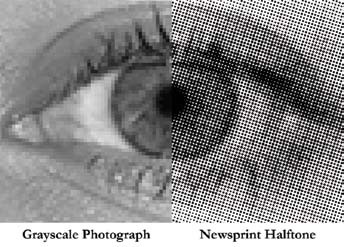 This is achieved via either a very time-intensive process called “segmentation,” where a radiologist manually traces the desired object on every single image slice (sometimes hundreds of images for a single sample), or an automatic “thresholding” process, in which a computer program quickly converts areas that contain grayscale pixels into either solid black or solid white pixels, based on a shade of gray that is chosen to be the threshold between black and white. However, medical imaging data sets often contain objects that are irregularly shaped and lack clear, well-defined borders. As a result, auto-thresholding (or even manual segmentation) often over- or under-exaggerates the size of a feature of interest and washes out critical detail. 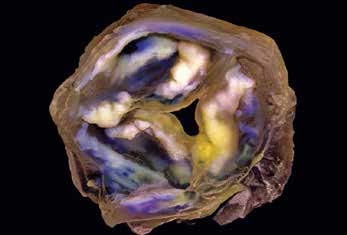 The team of researchers used bitmap-based 3D printing to create models of Keating’s brain and tumor that faithfully preserved all of the gradations of detail present in the raw MRI data down to a resolution that is on par with what the human eye can distinguish from about 9-10 inches away. Using this same approach, they were also able to print a variable stiffness model of a human heart valve using different materials for the valve tissue versus the mineral plaques that had formed within the valve, resulting in a model that exhibited mechanical property gradients and provided new insights into the actual effects of the plaques on valve function. The researchers hope that their method will help make 3D printing a more viable tool for routine exams and diagnoses, patient education, and understanding the human body. “Right now, it’s just too expensive for hospitals to employ a team of specialists to go in and hand-segment image data sets for 3D printing, except in extremely high-risk or high-profile cases. We’re hoping to change that,” said Hosny. For that to happen, some entrenched elements of the medical field need to change as well. Most patients’ data are compressed to save space on hospital servers, so it’s often difficult to get the raw MRI or CT scan files needed for high-resolution 3D printing. Additionally, the team’s research was facilitated through a collaboration with leading 3D printer manufacturer Stratasys, which allowed access to their 3D printer’s intrinsic bitmap printing capabilities. New software packages also still need to be developed to better leverage these capabilities and make them more accessible to medical professionals. Despite these hurdles, the researchers are confident that their achievements present a significant value to the medical community. 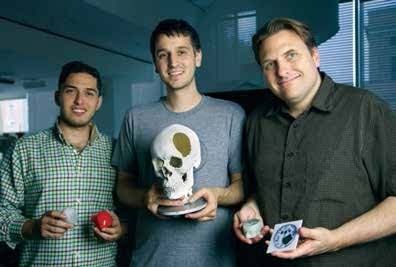 “I imagine that sometime within the next five years, the day could come when any patient that goes into a doctor’s office for a routine or non-routine CT or MRI scan will be able to get a 3D-printed model of their patient-specific data within a few days,” said Weaver. Keating, who has become a passionate advocate of efforts to enable patients to access their own medical data, still 3D prints his MRI scans to see how his skull is healing post-surgery and check on his brain to make sure his tumor isn’t coming back. “The ability to understand what’s happening inside of you, to actually hold it in your hands and see the effects of treatment, is incredibly empowering,” he said. “Curiosity is one of the biggest drivers of innovation and change for the greater good, especially when it involves exploring questions across disciplines and institutions. The Wyss Institute is proud to be a space where this kind of cross-field innovation can flourish,” said Wyss Institute Founding Director Donald Ingber, M.D., Ph.D., who is also the Judah Folkman Professor of Vascular Biology at Harvard Medical School (HMS) and the Vascular Biology Program at Boston Children’s Hospital, as well as professor of bioengineering at Harvard’s John A. Paulson School of Engineering and Applied Sciences (SEAS). The MIT Media Lab (http://media.mit.edu) came into being in 1980 through the efforts of Professor Nicholas Negroponte and former MIT President and Science Advisor to President John F. Kennedy, Jerome Wiesner. The Lab grew out of the work of MIT’s Architecture Machine Group and remains within MIT’s School of Architecture + Planning. The Media Lab opened the doors to its I.M. Pei-designed Wiesner Building in 1985, and in its first decade was at the vanguard of the technology that enabled the digital revolution and enhanced human expression: innovative research ranging from cognition and learning, to electronic music, to holography. In its second decade, the Lab literally took computing out of the box, embedding the bits of the digital realm with the atoms of our physical world. This led to expanded research in wearable computing, wireless “viral” communications, machines with common sense, new forms of artistic expression, and innovative approaches to how children learn.